When planning a holiday that includes pets self-catering is probably one of the best ways to enjoy yourself. Even so there are pitfalls and problems along the way. When booking the family holiday ensure that the owner of the property knows that you are taking a pet with you. For some reason many owners charge extra for a dog to stay on their property. There never seems to be a mention of cats or other pets that are just as likely to be staying with the family. As a condition of most rentals is that you leave the place in a tidy and clean state point out that a dog staying should make no difference to the rental price. Where will your pet be sleeping during the vacation? Smaller animals will have their cages and boxes but if a dog sleeps on the bed at home reconsider this for the duration of the holiday. Perhaps take a cage with you for the animal to sleep in at night. Pack several large sheets that can be put over settees and beds that the animal may brush past and leave hairs. It is easier to take home several soiled sheets that to worry how to clean the furnishing of the self-catering cottage. Keep water bowls outside the cottage if possible to save the floor from being continually wet. Have a towel by the door that can be used to dry off the dog or other pets before they come into the property. Avoid doggy smells by using a light spray on the dog such as lavender or a citrus. Remember that the family will want to visit theme parks and other places of amusement. Will these places accept pets? If they don’t, where will the animal be kept during the visit? The car can become too hot and it is not advisable to leave him in the rented cottage or flat alone. If you eat out what will the pet be doing? Restaurants don’t accept pets. Pubs with gardens will usually allow a well-behaved dog, but in the UK the weather cannot be trusted. Perhaps it is best to use the facilities of the self-catering cottage and have a family meal at home. 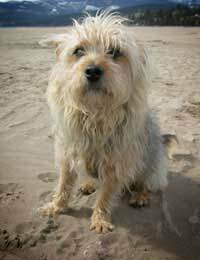 Many towns are not allowing dogs onto their beaches during the height of the holiday season. Make sure you have checked out the local bylaws before booking your trip. Think about avoiding the summer season and take your holiday in the spring or autumn when you will be able to walk your dog on the beach without fear of fine or retribution. Also remember to pick up after your dog. Take your usual food with you for the family pets, the brand you normally use may not be available at the holiday destination. If you are thinking of using a different brand ensure it is introduced to his diet slowly over the preceding two weeks, as the last thing you want is an upset stomach in a holiday rental. Do not use the china provided for the animals, pack your pet’s food and water bowls along with their grooming equipment.